The successor to the similarly designed Resettlement Administration, the Farm Security Administration was formed by an act of congress in 1937. One of Franklin Delano Roosevelt's most famous and important New Deal programs, the FSA strove to help struggling farmers endure the Great Depression. Through loans and assistance with relocation, the RA and the FSA aided thousands of farmers devastated by the ebbing demand for their goods and the dust storms that ravaged the Midwest. Also one of the New Deal's more controversial programs, the RA needed support to continue to receive its rather large amount of government funding. In order to do this the RA, and later the FSA, organized a historical section to create--and promote--a record of the devastation the depression had wrought on average Americans and the benefits FSA projects bestowed on needy farmers. In 1935 RA chief Rexford Tugwell lured Roy Stryker, who had worked with him in Columbia's economics department, to Washington to head the new Historical Section. Upon arriving in the nation's capital, Stryker asked Tugwell what he wanted him to do. "Show the city people what it's like to live on the farm," Tugwell responded (qtd. Anderson 4). 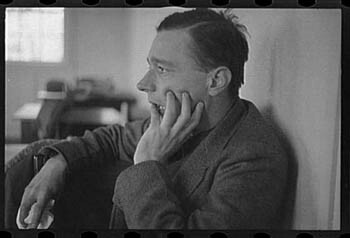 Portrait of Walker Evans, photo by Edwin Locke. Through Stryker's vision and an amazingly talented array of photographers which included Dorothea Lange, Walker Evans, Arthur Rothstein, Ben Shahn, Jack Delano, Russell Lee, Gordon Parks, and Marion Post Wolcott, "a cultural document the likes of which we may never see again" was produced (Anderson 3). Watkins calls the collection "a pictorial archive that in technical quality, artistic merit, and overall comprehensiveness is unequaled anywhere" (7). Although Stryker often remarked that he and the FSA photographers retained no comprehensive design, the project they pursued had from its start several goals: to illustrate the extent of economic disaster caused by the depression and to show how programs of the FSA and like organizations had benefited the struggling Americans. As the project developed and broadened in scope, Stryker would strive to establish a complete record of rural America and in so doing make Americans everywhere more familiar with themselves and their country. Furthermore, Stryker thrived in a part of his job arguably more important than having the pictures taken--distributing the photos to the masses. Robert J. Doherty remarks that "one of the elements of the Stryker genius was this ability to get his material to the proper audience" (qtd. in Anderson 9). Mainly through the new and wildly popular picture magazines such as Life, Look, and Fortune, Stryker ensured that nowhere could Americans be shielded from the images of despair and hope that he circulated across the nation. In the early years of his reign Stryker enjoyed almost complete control over which images the public would see, picking the ones he liked and even going so far as to destroy the ones he thought failed to represent his ideals (Brannan & Fleischhauer 338-339). His ideals he rarely articulated but the best photos he believed framed "dignity versus despair," capturing the farmer that needed and furthermore would succeed with it (qtd. in Brannan & Fleischhauer 36). As T.H. 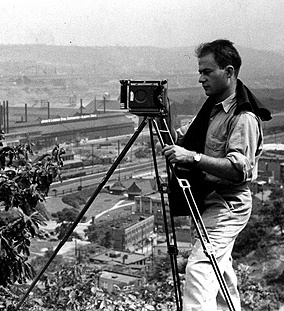 Watkins argues, the photographers themselves were little removed from the project's intrinsic pressures: "Ostensibly dedicated to the purest documentary goals, [they] were hardly unaware that their work was designed both to sell the need for the New Deal's programs and to celebrate their successes; decisions about what to photograph and to picture it inescapably were influenced at least subliminally by the imperative of their mission" (11). The group that Ansel Adams tabbed "a bunch of sociologists with cameras" snapped away all across the country. Shahn saw his mission as presenting "the ordinary in an extraordinary manner," a quest for "'the real thing,'" the true and enduring American values (qtd. in Brannan & Fleishhauer 65). Boasting all the tools of art and technology, some of histories finest photographers used the techniques of documentary photography to find what they saw as "the real thing."